1936. "Mt. Holyoke, Mass. - Paragon Rubber Co. and American Character Doll. Pressing rubber bodies (French)." With "Old Sadie." Continuing our guys-and-dolls series. Large format negative by Lewis Hine. View full size. Submitted by Buzz Phillips on Fri, 03/15/2013 - 2:56pm. The young man is very fit and handsome too! Submitted by mbennett on Thu, 02/28/2013 - 7:51am. Game over. This one won't be topped. Submitted by scoobylou on Fri, 03/01/2013 - 4:15pm. As nice as that is to look at, it would never fly today. It looks like his belt buckle is off to the side. Do you suppose the buckle interfered with the molds? I find that very interesting. Thanks Dave. Submitted by Ice gang on Wed, 02/27/2013 - 4:52pm. the unbelievable smell of hot steaming rubber wafting throughout the workplace, Yikes !! Submitted by Vintagetvs on Wed, 02/27/2013 - 4:42pm. Must be ripped & willing to work shirtless. Submitted by billybobtoo on Wed, 02/27/2013 - 3:15pm. Phew! It's getting warm in here! We Are Paragon, We Are Buff! Submitted by Solo on Wed, 02/27/2013 - 1:20pm. This and its predecessor photo suggest that one of Paragon's fringe benefits was a well-attended bodybuilding club. Submitted by A Californian on Wed, 02/27/2013 - 12:37pm. If they were still in business I'll bet they'd have cross-over photo advertising connections to Ambercrombie's and their rubber doll sales would be soaring to dizzying heights. Submitted by OTY on Wed, 02/27/2013 - 11:52am. I certainly am no expert in the art of making molded rubber toys, etc. but years ago I had a good friend who worked in a rubber glove factory. The ceramic molds had to be dipped in liquid latex, hardened and/or dried and then stripped off the molds in just the correct time period which was a very difficult and precise job The people who removed the rubber gloves from the molds were called strippers and those who dipped them into the liquid were called dippers. Needless to say, the molds were very heavy, often very hot and it was tricky to remove the finished product without tearing or damaging it. 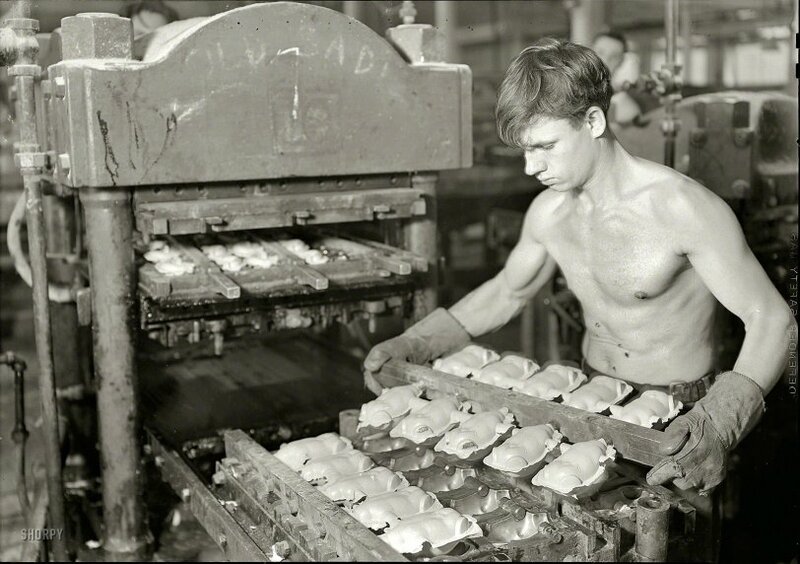 I believe my friend mentioned that the strippers had the most difficult job stripping the molds and I believe the built up biceps probably came from long term work of that type. This was over 25 years ago, so it may be much more modernized today. Submitted by Edna Mode on Wed, 03/06/2013 - 12:09am. What does the chalked inscription say on the machine? DOH! Missed that first time around. Sorry, Dave.